We did not get our Pick of the Week last week, as Washington State (-10) fumbled an interception through the back of the end zone, missed a PAT and were given a pretty good game by a plucky California squad in a 19-13 victory. We had a winning week on a reduced totals slate and struggled against the spread. For the first time all year, we struggled to get closing line value on our picks, reflecting a truly weird week. This week is a short slate of games in both college and the NFL, but we think we found a game here with Texas going on the road to play a beat up Texas Tech team. As we do each week, our pick of the week will get the point/counterpoint analysis, and the rest of our picks printed below. A reminder that you can follow us on twitter at @BrownBenjamin22 and @PFF_Eric and listen to the PFF Forecast with Eric Eager and George Chahrouri here. Point (Eric Eager): This is a pretty even matchup in terms of efficiency. On early downs, Texas Tech is slightly better as a passing team (55.98% success rate) than Texas (49.82%). In the run game, the Longhorns have the advantage (42.31% versus 36.86%). Defensively, after the debacle that was their Oklahoma game, even Texas has been more efficient than the Red Raiders as a defense, allowing fewer than 0.0 EPA per early-down pass (third in the Big 12) versus +0.6 for Texas Tech. All of this makes what the line is implying make sense. Where the edge is here is in that Texas Tech’s quarterback, Alan Bowman, is a question mark at best to play against Texas. He was good against Texas Tech after a string of three poor games, but his replacement, Jeff Duffey, was barely above 50 percent completion and was unable to complete the upset. 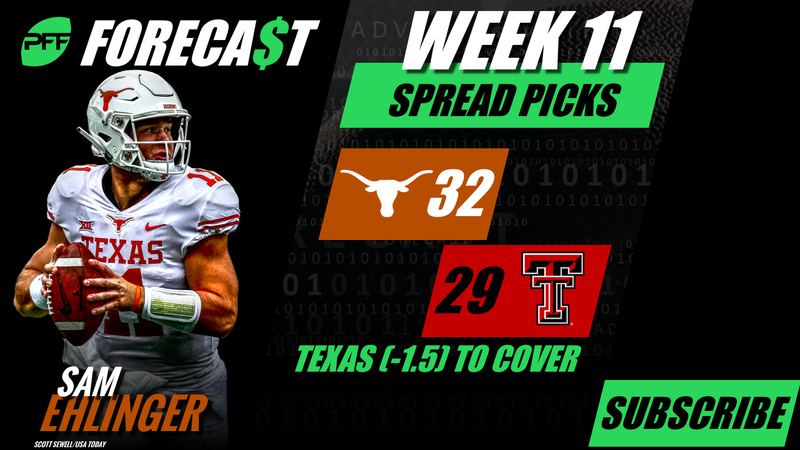 Sam Ehlinger presents too much of a mismatch in this one for me (and our model) not to see value on the Longhorns. Counterpoint (Ben Brown): Texas looks to rebound quickly after a heartbreaking loss to West Virginia in Week 10. Texas Tech played tough against a strong Oklahoma team but after losing Alan Bowman, couldn’t keep pace offensively against the Sooners. The big question is the health of Bowman as the Red Raiders are a completely different team with him leading the offense. Bowman wasn’t available in Texas Tech’s win over TCU and the Raiders struggled in all offensive efficiency metrics that week. With Bowman released from the hospital and rejoining team activities November 7th, his status is still up in the air for Week 11. That uncertainty is factored into the line and if he is able to play could move this line down to a pick ’em situation. If that is the case, in an expected shootout, this game could come down to whichever team has the ball last, just like it did in last week’s Texas vs West Virginia matchup. Hopefully, for our pick, it doesn’t break wrong two weeks in a row for the Longhorns.